Boxing: The Theater of the Unexpected! Boxing is the highest form of competition. There is no one to whom to pass the ball, no one to help you out when you are in trouble, no excuses. It appeals to the macho side of every man. The heavyweight champion since the days of John L. Sullivan has always been considered "the strongest man in the world." Forget the power-lifters and the body builders, every gym rat knows full well that a boxer can destroy the muscle-bound in seconds! The roughest and the toughest man is the truly strongest man. And the strongest man can end a fight at any time. One fighter can be utterly superior to his opponent, out-boxing them and winning easily, when one unexpected savage blow can not only turn the course of a fight, but also end any further action. I’ll never forget the night John Tate was giving Mike Weaver an unwanted lesson in boxing 1980 (for the WBA heavyweight championship). Tate had won 12 of the first 14 rounds. In the 15th I was beginning to add up my scorecard, when suddenly one crushing left hook by Weaver ended the contest. Tate, who was undefeated and looked for all the world like a champion for 14 rounds, fell like a tree. I was no longer watching a sport, I was in a place akin to the Twilight Zone, the theatre of the unexpected. There have been other such tales of woe and destruction in boxing’s long and illustrious history, when an unexpected ending to a bout came true with the swift assurance of a mighty blow. Bob Fitzsimmons was losing to James J. Corbett, having been down once in the 6th round, and was being completely out-boxed. He came back to kayo Corbett with the now famous “solar plexus punch” in the 14th. Jack Dempey, Joe Louis, Rocky Marciano, Sonny Liston and George Foreman were renowned for their ability to end a fight with one punch. Nothing can match the type of electricity and excitement that occurs during those moments. All it takes is the right punch, delivered the right way, landing in the right place, and POW – you have entered the theater of the unexpected. Perhaps the term “the theatre of the unexpected” applies equally well to the unexplainable endings of many important boxing matches. Who can forget tough guy Roberto Duran crying “no mas” in the second Ray Leonard fight? Or Rock Newman and Riddick Bowe tag teaming Elijah Tillery along the ropes? Or Andrew Golota going ballistic and fouling out, while beating Bowe to a pulp? How about the many horrible decisions we’ve all been witnesses to such as the Holyfield-Lewis “draw”? The sport goes from the majesty of the “king of sports” to the base “gutter of sports” in seconds. Yes, even for those reasons, boxing is the theater of the unexpected. Perhaps no fighter in history exemplifies both the terrifying power and irresistible appeal of boxing, as well as the sheer lunacy to which the sport is prey, than does Mike Tyson. His crushing one-punch knockouts of men like Trevor Berbick and Francois Botha are what attract many fans to the sport. Like the psychotic character Twoface from the movie Batman Forever, boxing’s Janus face is always changing from moment to moment. With the speed of a flip of a coin, Mike Tyson erupts (after being head-butted) in his rematch with Holyfield, and in the space of a second, Holyfield is minus part of his ear. Now that was unexpected! In the latest episode of the continuing drama that is Mike Tyson, he drops Orlin Norris after the first round bell, and Norris suddenly quits on his stool, claiming a knee injury. A post-fight examination revealed that Norris had dislocated his knee, but whether or not the punch was intentionally thrown is questionable, though I personally do not feel it was (only Tyson knows that for sure). Whatever one thought about the blow, it was another night of controversy for boxing yet another foray into the unexpected. Perhaps that’s not the bad thing we make it out to be. Boxing thrives on controversy. A black eye is not so bad, after all, we can still see out of the other eye right? We know that for every bad decision, and chaotic night, we are only one punch away from glory! 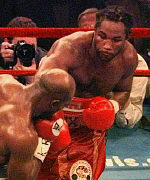 Such a night occured in the week proceeding the Holyfield-Lewis rematch. HBO's BAD (Boxing After Dark) featured two sensational knockouts by heavyweights that stunned the crowd. This is why we watch boxing, the opportunity to witness an unexpected and devastating knockout victory! Hopefully the heavyweight championship re-match between Evander Holyfield and Lennox Lewis will add to the drama of boxing lore. The theater of the unexpected sets the stage for the spectacle, often despite itself.